Join the discussion on our forums! Come discuss Storm Chaser over in our dedicated Storm Chaser discussion topic. Battlecry: Draw a spell from your deck that costs_(5) or more. Best drank after a stiff gale. Sorry Faithful Lumi, I think I just found my new cutest card of the set. Might as well just say "draw Bloodlust or Volcano from your deck". In all seriousness playing this on 4 and having access to volcano most of the time is quite good. Since there's only 2 volcanos in the deck. Keep in mind you can just run one of these not 2 and would make a lot of sense. 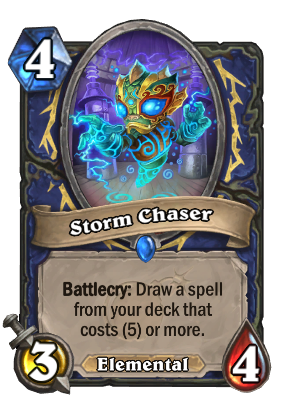 So many Shaman spells above or at 5 mana are devastating. This card is going to be amazing. the only problem is that you get a 5mana spell eachtime you play shudder, so your hand gets filled super quick. This card may be playable in some decks (e.g. to scry for Bloodlust, lesser sapphire spell stone, or Volcano), but it really would be so much better if it had the 4/5 Leyline Manipulator statline. There are a ton of 3-drops that this is going to die to, and that seriously hurts the tempo value of this card. Well can be a decent tailor tool, as you don't have many expensive spells naturally in Shaman. In the case that a Eureka! Maly deck ever exists, this card will carry it to at least Tier 2. Wouldn't Volcano be rotated out since it's a Journey to Ungoro Card? Rotation happens once a year every April. Not every expansion. Thanks for the clarification. I tend to get them mixed up. Is it a sign that elemental shaman is coming to town? Not only elemental tribe but true caster! Good! Just wait for the shaman legendary spell. Current possible variants: Volcano, Bloodlust, Everyfin is Awesome, Lesser Sapphire Spellstone, and Eureka! Somebody should probably let them know about the distinct lack of storms. Wait for the legendary spell!